Kronan Loose (lös) snus is a unique robust tobacco taste combined with gentle flowery elements, dash of sweetness, brine, and citrus. 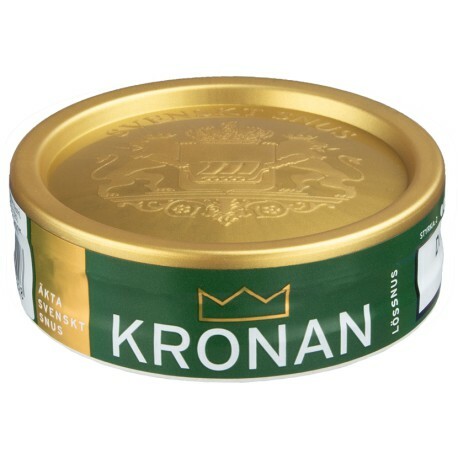 Kronan Loose (lös) snus has a unique robust tobacco taste combined with gentle flowery elements, dash of sweetness, brine, and citrus. Sounds like an odd combination, but it works really well. This may not be an everyday snus for everyone, but once you try it, you will experience Kronan cravings when you least expect it. I don't want pickles in my snus. Yes, it tastes like dill. Yes, it tastes like pickles. It's flavoring is not as strong as some may lead you to believe. The dill is definitely there, no doubt about it, but it's not like a pickle. More like what you would get from fresh dill. There's a citrus zing you can only get from fresh dill, and it's there along with violet. However, you mostly get tobacco. The dill really only comes out around the 25 minute mark or if you move it around a bit. Definitely a 'hillbilly pincher's' dream. Quite easy to just grab a big amount and you're good to go. Of course, if you're not a fan of dill, tread lightly as dill (even as light as it is here) is not for everyone. I happen to love the herb, so it's a win-win for taste, pinch, and price. A very good mild blend. Flowery, with a bit of citrus, just as promised. I definitely like this one, and will likely add a few cans to the next order. Good for relaxing around the house with a good book, for some reason.